2012 NC Miata with ZunSport full grill, FM Stage II Suspension with Koni Sport adjustable shocks and adjustable front and rear sway bars, Kosei K5R 17x9 48 16.9lbs wheels and 235/40/17 tires. I love my MX-5 Miata but the suspension was surprisingly Buick-like so it really needed a suspension makeover. 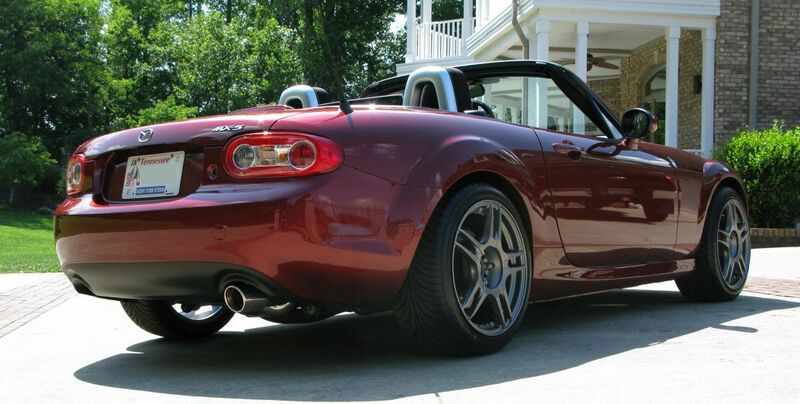 I chose Flyin' Miata's Stage II suspension kit with Koni Sport adjustable shocks. It comes with nicely matched springs, shocks and adjustable front and rear sway bars. I cut 1/2 of a coil from the front springs for a slightly positive rake. I also replaced the stock bump stops with FatCatMotorsports 36/58 white (300in-lb front, 200in-lb rear). With Flyin' Miata Stage II Suspension. 1/2 of a coil was cut from the front springs to try to even out the fender gap and give a little forward rake. Stock Suspension - fronts and left rear 14 7/8", right rear 15"
So I dropped 1.25" in front and 1.5 in the rear. I should have taken a whole coil off the front to get the fender gaps equal but the car's front jack points are about 1/16" lower than the rear jack points so the chassis does have a little forward (positive) rake. I used a 12" chop saw to cut the spring coils and it still took me almost five minutes per coil. Good-Win Racing light weight Street Single exhaust. I also replaced the stock bump stops with FatCatMotorsports 36/58 white (300in-lb front, 200in-lb rear). 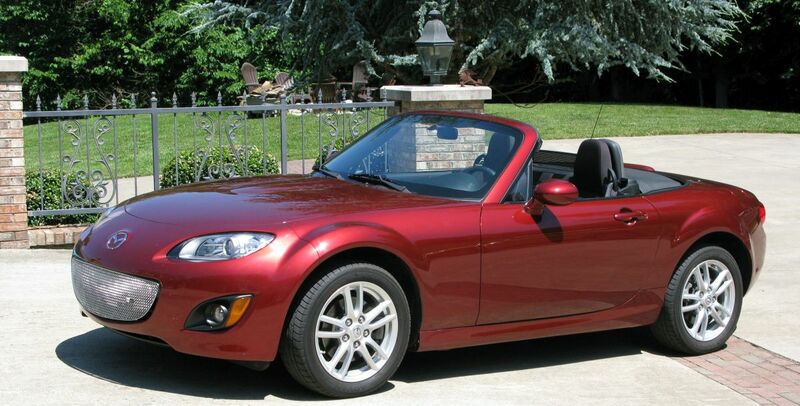 *(1) Most Oversteer setting and closest to stock NC Miata of 46%. Yellow Koni Sport adjustable shocks are custom valved for the FM spring rates. FM rear sway bar is visible. Cat-back exhaust is Good-Win Racing Street Single. I love it. *Front Roll Couple Percentage describes lateral load transfer distribution front to rear and subsequently the handling balance. It is the front roll stiffness divided by the total roll stiffness which is a ratio, front to rear, of the vehicle's total roll rate. Higher than 50% means the front wheels take more weight while cornering and the handling progresses toward understeer but for most cars around 55% gives balanced handling on the track while approximately 75% is best for autocross. For powerful cars a higher FRC% can help prevent power-on oversteer so a turbocharged Miata will typically need a higher FRC% than a normally aspirated Miata. I much prefer the Koni's over the Tokico shocks. I followed the included FM instructions except as noted below. Note that the front and rear shocks are different so verify you have it correct before installing one. I also installed FatCatMotorsport bump stops and they are also different front to rear. The short bump stops go on the front, the tall on the rear. Don't install the front sway bar until you have the new shocks completely installed--you'll appreciate the extra room. I had to take the front fender liner completely off (as per FM instructions). I didn't have to completely remove the center splash panel under the radiator. I loosened it on both sides (FM says remove it). I left the center front screw and the four center fasteners in the rear. Jack the front of the car as high as possible. It makes threading the FM sway bar in easier. To get mine in I had to be able to pull the splash pan downward to make room for the insertion. 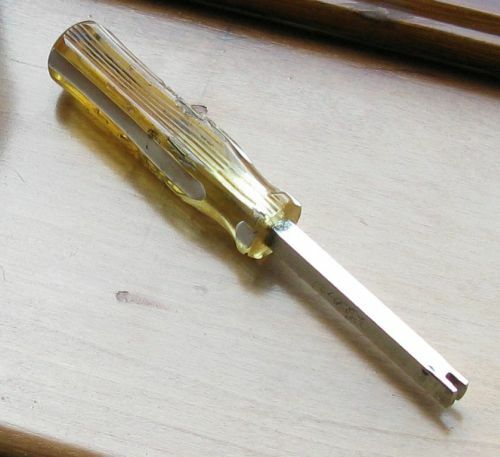 The initial insertion has to be with the bar's arm going straight in like a knife. To do that I had to place the other end of the bar in front of the car--the other bar arm was in front of the headlight. Once you get the arm in you can bring the bar around to the "upside down U" position and feed it in so it's above the steering rack. I did this alone but a helper would make it easier. Remove rust from any bolts: My sway bar end link bolts were rusted and I simply put some penetrating oil on them and let them soak. I ended up seizing both nuts as I attempted to take them off. They came about halfway off then stopped. The nuts got so stuck the bolt's allen key hole stripped out. I cleaned the other end link bolts (the end connected to the lower arm) with a small wire brush and the nuts came off without even needing the allen key. You MUST use a spring compressor to remove the stock front springs. I bought a compressor at O'Riley Auto Parts for about $35 (I had a compressor but couldn't find it). I got the one that has the small U bolts that go around the springs. 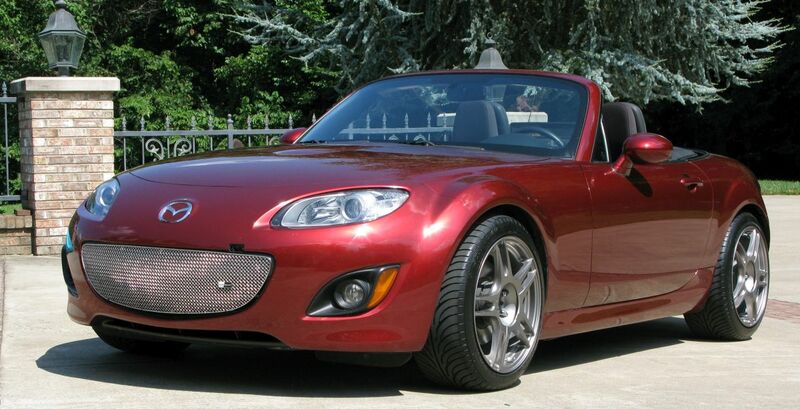 My MX-5 is a 2012 so I cut 1/2 of a spring coil from the top of the front springs to even out the fender gaps. In the end I wish I had removed a full coil as the rear fender to wheel center was still about 0.2 inch greater than the front. Even so I still had about .125" (1/8") of forward rake measured at the jack points and I need to adjust the headlights higher. I didn't have a helper so I had to use the spring compressor to install the front FM springs. With a helper to thread on the top nut it can be done without the compressor. With a helper just install the big washer and top nut, you can easily put the big rubber bushing on after you get the shock installed in the car. I used my impact wrench to tighten the compressor bolts. If you have the upgraded FatCatMotorsports bump stops install the short bump stops on the front shocks. I drove up on a set of ramps to tighten the upper arm, lower shock and sway bar fasteners to set their bushings. If you don't do this you'll have a higher than normal ride height and you'll destroy your bushings. For me the rear shocks were much more difficult to install than the front--I know that's the opposite of most people. If you have trouble getting the upper arm bolts out use a big screwdriver to pry them outward as you turn them with a wrench. I could not break the shock top nut loose, even with an extra long 17mm wrench so I took the shock out with the top hats attached. Those damn upper hat nuts are a pain to loosen and tighten. The stock rear springs can be removed without a spring compressor. I just hit the shock top nut with my impact wrench and the nut came off with no drama. The rear springs are under much less preload than the fronts. If you have the upgraded FatCatMotorsports bump stops install the tall bump stops on the rear shocks. I could not get the right rear suspension's front upper arm tightened from under the car while it was on the ramps. I just could not contort my arms in there to get it done. The strange thing is the left side suspension wasn't a problem. I had to raise the front left corner with one jack, remove the wheel, then use another jack to support the knuckle, remove the other jack to place the weight on the knuckle, then level the rear of the car so the knuckle was in the position it would be with the wheel in place. With the knuckle supporting the weight of the car I tightened that damn front upper arm. I installed a shock tower brace with holes for adjusting the shocks but the Koni plastic adjusters didn't fit so I made this adjustment wrench by simply cutting a slot into a 1/4" driver using a Dremmel and cutting disk.